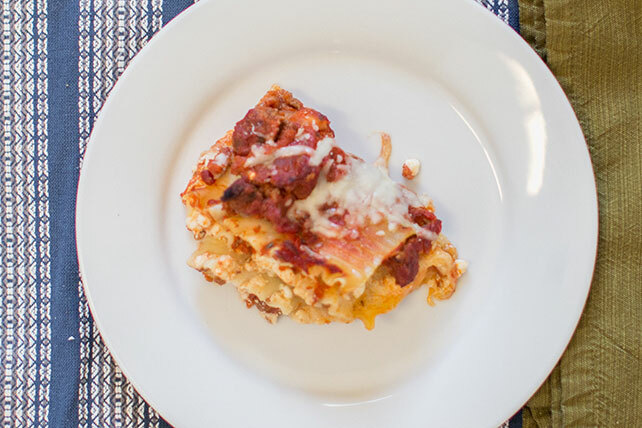 Find your new go-to meat lasagna recipe here! Our Healthy Living Cheesy Meat Lasagna Recipe only takes 30 minutes to put together and serves nine people. Brown meat with garlic and oregano in medium saucepan. Stir in pasta sauce; simmer 5 min. Remove from heat; stir in tomatoes. Spread 1/2 cup of the sauce mixture in 13x9-inch baking dish. Layer 3 noodles, 1 cup cottage cheese, 1/2 cup mozzarella and 1 cup of the remaining sauce mixture in dish. Repeat layers. Top with remaining 3 noodles and remaining sauce mixture; cover. Bake 30 min. or until heated through. Uncover; top with remaining mozzarella. Bake, uncovered, 5 min. or until melted. Let stand 5 min. before serving. We've made over a traditional lasagna that results in a savings of 120 calories and 10 grams of fat per serving. We replaced the sausage with extra-lean ground beef and decreased the amount, used cottage cheese in place of ricotta cheese and used KRAFT 2% Milk Shredded Mozzarella Cheese. Prepare as directed except for baking; cover. Refrigerate up to 24 hours. When ready to serve, bake, covered, at 375°F 40 min.